Place in fiction is a powerful factor. At its most basic it's about getting a sense of the physicality of a location. Reading this descriptive rendering of place sometimes provokes a sense of familiarity, sometimes a sense of discovery. At its most complex, place in fiction excavates layers, going beyond the mere physical make up of a location to reveal the historical, social, cultural and political strata that construct a place and its people. When it comes to crime fiction - place is usually one of the elements of the work that is most commented on in reviews. What would a review of James Lee Burke be without commentary on the "sense of place" he creates in writing about Mississippi, or Ian Rankin's rendering of Edinburgh? The way place is used in crime fiction lends itself to close consideration. I've written about it as part of my Masters degree. I wrote a chapter, Crime Fiction and The Politics of Place: The Post 9/11 Sense of Place in Sara Partesky and Ian Rankin, and talked at length about Blacklist and The Naming of The Dead, and the way place not only informed the location of the novels but shaped the plot, the politics, the people and the crime. Place, politics and people were central elements in my novel The Old School and I'm really excited to have been invited to come along and talk about this at The Scene of the Crime a crime fiction symposium being held at The University of Western Sydney's Writing and Society Research Centre on Wednesday 27th June. It's going to be a fascinating day talking about crime fiction. Victorian London, post-WWI England, the mean streets of L.A.: in crime fiction, place matters. It is crucial to the evolution of the genre and the signifying possibilities of specific texts. Has this changed in recent years? Intensified? Diversified? Think Rebus’s Edinburgh, Wallander’s Ystad, Ellroy’s L.A.
How do crime narratives imagine the city and the country, the sprawling metropolis and the regional locale, urban decay and vanishing wilderness? From Melbourne to Massachusetts, New Orleans to New Zealand, Botswana to Bankstown, from the Yorkshire moors to the Siberian tundra, from bayou to desert reservation: the scene of the crime and the journey of detection shape popular and literary crime fiction alike. 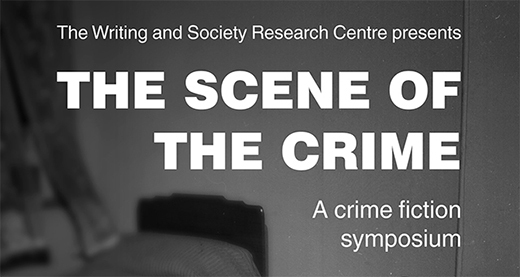 ‘The Scene of the Crime’ asks, what is the relationship between crime fiction and representations of place?